News in overnight from Bob Crow at Denison Yacht Sales that he's closed on his listing for sale, the 31.39 metre motor yacht Trilogy, with Scott Grosky at Sundance Marine representing the buyer. Trilogy was built in aluminium by US yard Broward Marine to an in-house design and delivered in 1988. This classic American superyacht is in excellent condition following several refits, most recently in 2010 when she was repainted and her teak decks revarnished. Trilogy has had continuous mechanical upgrades since 2008 – her engines and generators have been rebuilt, running gear and steering system updated, and most pumps replaced. Her modern interior can accommodate six guests in three staterooms consisting of a master suite with a king sized bed and two double staterooms with queen sized beds. All staterooms have en suite bathroom facilities. 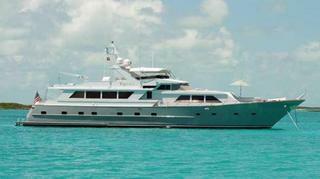 Superyacht Trilogy also has extensive deck spaces offering several areas for relaxation and alfresco entertaining. Twin 780hp GM engines give her a range of 2,500 nautical miles. Lying in Fort Lauderdale, Florida, Trilogy was asking $995,000.